In China, food pervades everything. A large percentage of each day seems to be filled with going to the market, eating, or just talking about food. In my Chinese textbook I learned that one common greeting is, ” Have you had your rice today?”? While this doesn't seem to be true here in Sichuan, it's completely normal to talk to people and ask them if they've eaten, if they're full, what they ate, and also to caution them either to eat slowly or eat quickly, depending on the situation. People in Sichuan are also inclined to tell you about their regional foods, particularly their specialty peppers. Additionally, food is fundamental to their hospitality and social interactions, as I have learned from living with a Chinese roommate, with whom I visit markets and cook on a regular basis. My first week in China was spent being ushered into a variety of tiny rooms in restaurants that all served the same food. The Chinese seem obsessed with ” VIP”? treatment””whether ” VIP discount cards”? for discounts, or, for me, private dining rooms. After two full months here, I have yet to eat in a restaurant without having a special room, reserved for ten of my new best friends. Most restaurants feature a large empty area where nobody eats and many small, private rooms for actual dining. Go figure. I guess only plebeians would visit a restaurant where they had to eat in public. Being hospitable to a Westerner seems to involve catering to a lot of stereotypes about Westerners, but it's the thought that counts, right? For example, while all the Chinese will drink tea, they usually get me coffee, which is much more expensive, without even checking first. When I finally declined coffee (I get uncomfortable being continually hosted), they gave me sugar water instead. Why? Because Americans love sugar, they believe. They often give me bowls of sugar with things like rice, just to be nice. Thanks? Then they worry whether I can tolerate spice. When I went to a hot pot restaurant with a colleague, she took things out of the spice and dipped in a water bowl before placing it before me. I could not help noticing that the only other person who got this treatment was her three-year-old. And I wonder whether the overabundance that they force on me is because I'm a guest, an American, or just way bigger than most Chinese people, but it's definitely enough for at least three people. Offering things to people is also incredibly hospitable. One gives others tea before taking it. One hands out chopsticks and, sometimes even dishes that could easily be reached without help. For example, the standard bucket of peanuts on the table is always placed directly in front of me, together with the caution that I eat them slowly. I can reach them easily myself, thanks, but I appreciate your forcing them upon me. Asking others to sit is also incredibly important– even if you are standing outside, good hospitality requires that chairs and stools and benches be brought to you, so the gathering soon goes outdoors, seated. In fact, more commonly in rural Sichuan, one winds up dining al fresco. Additionally, the role of filling cups of tea falls to the youngest woman at the table, and filling glasses becomes an enormous sign of respect and politeness. Toasting demonstrates hospitality in another way too. 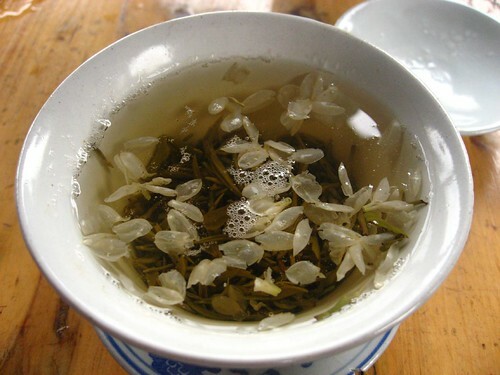 Most Westerners know the Chinese toast, gan bei (which literally means ” dry glass”? ), but the intricacies of the drinking ceremonies are truly amazing. First, one always wants to fill the glasses of others, but they will resist and try to pour them instead. This ritual leads to violent grabbing of hands and glasses and forcing alcohol on others, a real spectacle! There follows intense peer pressure towards competitive drinking– if others are drinking, you must too, no matter how many times you say you'd rather not (or cannot handle it). You also have to finish the entire glass, since the person toasting you does; otherwise, they hold out their dry glass, point at it, and mock you until you do. Oh, you might be excused from drinking if you don't start at all, but once you do start, there is no escape. They will chase you down. Finally, giving people delicacies obviously forms a big part of hospitality. Bringing gifts, particularly fruit (better if wrapped in cellophane), is excellent form and will win you a lot of ” face”?– Chinese respect. However, at restaurants, the gifting involves putting tasty morsels in other people's bowls. For me, this is almost always disgusting, especially that fish head, complete with eyes, in my bowl–even if it is a great honor. Some honor: I have to eat fish eyes. 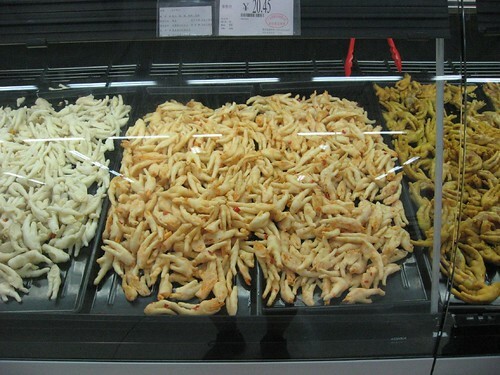 Nor do I also really want chicken feet, especially offered talon-first. Trying to eat around the edges of the chicken feet and thus avoid bones (I hate bones) actually led to the joint bending””yuck! One woman even bit walnuts in half to give them to me. I was raised right, trained to eat everything put in front of me so as not to be rude, but obviously some forms of hospitality require cultural adjustment. Lest this make you think otherwise, overall I love the food in China– but it certainly is an adjustment! Stay tuned for another post about my reflections on food in Sichuan….coming tomorrow. Photo Credit: Restaurant picture photo by Laura Silver. All other photos courtesy of David Lee. Chinese foods are really tasty, I can’t wait to taste them next month when i visit my uncle in Shenzhen.